This is a family oriented competition. It is shot with 22 cal. pistols, or rifles with or without optics. You can use your gun or ours. If you use our gun, you must purchase the ammo here. 100 rounds/$8.00. The course of fire is steel plates and is shot against the clock. you shoot the course 5 times (50 rounds) and throw out the worst score. There is a penalty for missed targets. The four scores plus penalties are added together for your final score. 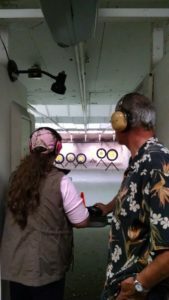 The course is easy and is ideal for anyone just starting shooting competition. Our range officers will talk you thru each step of the match. You can shoot the course as many times as we have time for.